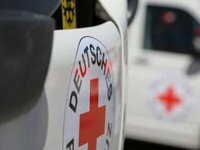 The International Committee of the Red Cross (ICRC) has sent 255 tonnes of humanitarian aid to territories temporarily uncontrolled by Ukraine, the State Border Guard Service of Ukraine has reported. "Some 12 trucks from the International Committee of the Red Cross and eight trucks from the Office of the United Nations High Commissioner for Refugees (UNHCR) have crossed the Novotroyitske checkpoint to enter the temporarily occupied territory," the press service of the State Border Guard Service of Ukraine said on Friday morning. The information says that all vehicles transported food and hygiene kits, stationery, printed and building materials, medicines, medical supplies, an electric convector and a winter household kit for a total weight of almost 255 tonnes for residents of Donetsk region.